Fiocchi's Exacta line serves the discriminating needs of accuracy-oriented target shooters and hunters. Exacta shotshells use top quality shot, propellants, cushioned wads, and primers. This 12 gauge 00 buck load, in addition to its superb craftsmanship, boasts a high muzzle velocity of 1325 feet per second. This 250-shell case offers the dedicated shotgun user the opportunity for bulk savings and convenience. A family-owned ammunition company, Fiocchi Munizioni produces a wide range of centerfire rifle and pistol cartridges and shotgun shells at its US facility in Ozark, Missouri. 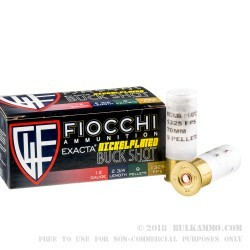 At its headquarters and factory in Lecco, Italy, Fiocchi also produces rimfire cartridges and other ammunition for European shooters, law enforcement officers, and military personnel. In business for over 150 years, the company holds NATO and ISO certifications; its ammunition possesses a strong reputation for good quality and reasonable prices. 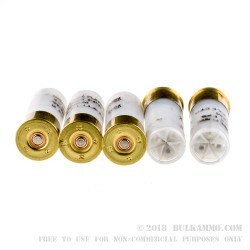 SEMI AUTO SHELLS. ANY RUSIAN SHOTGUN WILL RECYCLE ANYTHING YOU PUT IN. VEPR-12 GA will recycle any Semi-Auto Ammo even at 1100fps. Just change your recycle spring to a Wolf HP Spring. If not change your Gas Puck, You are losing gas to recycle your shells. When i think of high velocity buckshot I think of max power, shoulder crunching, power crushing ammo. I was disappointed when I bought this (it works just fine out of my 930 SPX) but if given the choice get the Remington full power buckshot instead. It high brass (the Fiochii IS NOT) and it hits twice as hard. If you are looking for medium power buckshot then its fine. To me if it says HIGH VELOCITY, my expectation that it will equal the Remington. Good groups at 25 yards. Q: Is the shot used lead, brass or steel? 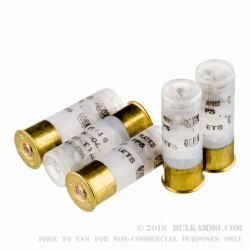 A: These shells are loaded with lead 00 buck shot. Due to the weight required for 00 buck shells, lead is always used as steel is too light of a material.